Rayger is the first consumer level, frequency responsive music lightshow.  Bring your music to life with ultra bright LEDs that flash to the beat of the song, stimulating your senses in a way you have to see to believe. We raised $24,900 from 200 backers on Kickstarter and are now offering all of our products here on our website. Just check out the products tab. Do you want to bring new energy and excitement to your live music performances? Or light up the atmosphere in any room, car, or music venue? From reinventing Christmas lighting to supplementing professional DJ equipment, the uses of the Rayger are limited only by your imagination. Using audio frequency filtering technologies, the Rayger flashes strands of ultra bright LEDs with the beat and intertwined rhythms of music, creating a totally unique music visualization system. Unlike other music light shows that are controlled by audio volume, the Rayger bases its visual response on the different frequencies, or pitches, present in the music for a one-of-a-kind audio-visual experience. Up to six strands of lights move to all of the intricacies of your music, so you’ll be able to see that sustained high note on one end of the light spectrum and the bass drop on another. Our Kickstarter video should answer any questions you have about Rayger! Using either the included auxiliary cable or the built-in microphone, the Rayger splits your music into six channels based on the different audio frequencies present in the song. Audio frequency is simply a technical term for a musical note or pitch, so each of the channels will only respond to a certain group of pitches, such as the low bass notes. These channels control the different strands of LEDs, so each strand will only light up when its corresponding notes are present in the song. This way, one strand will flash with the bass, another with the treble, and the other strands divided among the pitches in between. Using audio filtering technologies, the Rayger responds immediately to music so that the audio and visual experiences are completely in sync.